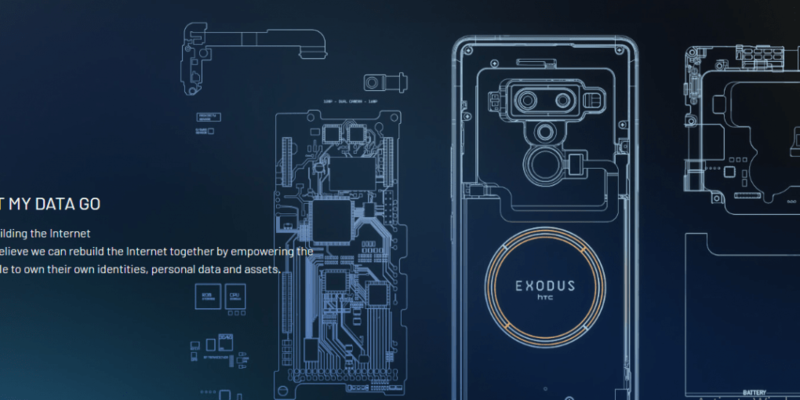 If you are crytocurrency trader, this should sound good: HTC has launched HTC Exodus 1, which is a blockchain-powered smartphone. The device offers a universal wallet for online money and supports many decentralized applications. In other words, it is a device that will eliminate the need of top-notch cryptocurrency mining and storage devices. The device will support all block-chain protocols and the key reason the manufacturer developed it was to provide adequate support for the blockchain system and to enhance the expansion of dedicated nodes. For user satisfaction, the new device provides higher data protection and security standards. To start with, blockchain is a type of public ledger. It records, secures and verifies every digital transaction and that is the key reason why all industries are adopting it. The technology involves more than the financial transactions and affects most industries like healthcare, retail and supply chains. The new blockchain-powered device offers improved safety and security for online money. The device will also help people trade directly with their peers without the need of a high-end computer. The device offers numerous benefits. For cryptocurrency trading beginners, the new wallet (known as Zion) allows storage of cryptocoins in the smartphone itself. Your internet money will be safe in more secure enclave, which uses SoftBank’s Arm Holdings and remains separate from the Android device. The new product will enable storage of the keys to cryptocoins and token like the CryptoKitties in the highly secured enclave. HTC also added a social keys recovery system in this device. Fundamentally, you can choose to keep your phone recovery details with friends – ask them to install the management app. HTC sends information to selected contacts using their sharing algorithmic rule, which you will be able to piece together when necessary. The full details about HTC Exodus design are somehow vague, but the available pictures should provide you with an idea of how it looks. Apart from the advanced technology, the device is not very different from the other smartphones in the market. It boasts a dual-sensor camera on its backside and a fingerprint sensor below it. The blockchain boosted smart device from HTC is already out. However, you should not mean that anyone could go for it. It is currently retailing at 0.15 BTC or 4.78 ETH. Put in real-world money form, you will need $1000, £600 or AU$1,300 to buy the device. Up to now, the producer has not announced the price in real-world money form, but Phil Chen (HTC Exodus head) said that the price is comparable to the $1000 Finney blockchain-powered smartphone that Siri released to the market. Some people in around 34 countries such as Hong Kong, UK, USA and Singapore have already bought this product. HTC Exodus 1 might not launch in the Chinese market because of the set rules and regulations. The number of people making money from the trade of cyptocurrencies is increasing. Unfortunately, the blockchain technology is not deal for most smartphones. High-stakes trading and crytocurrency mining requires powerful hardware. That is the key reason why HTC has worked for a long time to develop the new product. The device will function as the node for cryptocurrency trading among the users. Storage is a vital element of every form of trade in the modern world. That might be the primary reason why the developer of HTC Exodus 1 included a more secure online money storage wallet. The wallet supports all forms of online money and decentralized apps. You do not need to look for online services to store your coins anymore; you can also store them on the hardware. In other words, the manufacturer has added an additional layer of security for your hard-earned money. Did you know that you have to connect to the fast networks for efficient cryptocurrency transactions? Now you know. That is the key reason HTC upped on the security features. The secure enclave the device features, the “trust zone,” in its Arm hardware will prevent chances of losing your money. The other included standard, the “trust execution environment” enhances the protection. The Exodus 1 will run on the Android O system. Put differently, this block-chain powered device with come with all the important Google services in addition to security tools that HTC offers. For example, it will come with a unique recovery safeguard tool, which will come in handy if you happen to mislay the device. In other words, you can use unique key in recovering or accessing a wallet. When setting up this device, you will have to select a few people who will keep parts of your access key, which is only accessible through the offered app. In case this device lands on wrong hands by any chance, you will have to obtain all the parts of your safeguard key to continue accessing the cryptocoins wallet. The smart device comes with a capacitive battery, octa-core processor, and adequate RAM to handle cryptocurrency mining processes. For now, HTC claims that this product is the first of its kind in the market, but that is not the case. Finnely Phone, another smart device suitable for cryptocurrency trading, entered the market in the first quarter of year 2018 and it is therefore the first in this line of devices. The device will facilitate both spending and storage of online money without the user incurring any additional costs. Exodus 1 was developed to help solve most of the problems expected with online cryptocoins storage and the concentrated markets. A quick example: earlier in the year 2018, Coincheck Exchange lost over $532 million to hackers – that is a huge amount. HTC allows use of quarantined ARM processor sections known as TrustZone to store cryptocoins. The product is safer than software-based wallets. 7 Fastest Smartphones In The UK – 3rd Will Amaze You!